Gyaltsen Norbu, the 11th Panchen Lama selected by the Chinese government. (TibetanReview.net, Jun04, 2015) – The 11th Panchen Lama chosen by China in place of the one recognized by Tibet’s exiled spiritual leader, the Dalai Lama, in 1995 has reaffirmed his pledge of allegiance to Beijing during a seven-day tour of Yunnan Province, according to a report by China’s official Xinhua news agency Jun 2. It said Gyaltsen Norbu, who is not accepted by mainstream Tibetans as the reincarnation of the late 10th Panchen Lama, Tibet’s second most eminent religious figure, pledged to uphold patriotism and make contributions to national unity, ethnic solidarity, religious harmony and social stability. The report added that he called on all Chinese Tibetan-Buddhist followers to love the country, make efforts to benefit the people and practice benevolence to promote social development and protect national interests. The report said that during the tour, which ended on Jun 1, he visited two local temples, a Buddhist college, the provincial capital Kunming and the Xishuangbanna Prefecture. 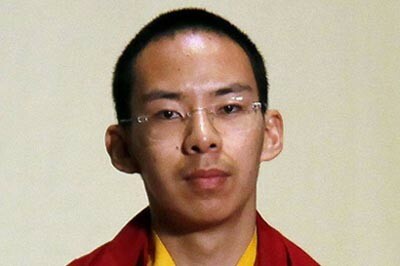 And during his visits to local temples, including the Sumtsen Ling Monastery, the largest Tibetan-Buddhist temple in Yunnan, the replacement Panchen Lama chanted sutras and prayed for all living beings. There has been no news about the 11th Panchen Lama Gedhun Choekyi Nyima recognized by the Dalai Lama in 1995 ever since the Chinese government took him and his family away on May 17, 1995. The Panchen Lamas traditionally live in Tashi Lhunpo Monastery in Shigatse City, southern Tibet. China, for its own reasons, keeps Gyaltsen Norbu in Beijing, taking him on occasional visits to Buddhist temples in Tibetan areas, including Tashi Lhunpo. Communist China calls the late 10th Panchen Lama a patriot, although it had jailed and tortured him for many years for speaking up for the Tibetan people’s rights, their religion and culture, and against China’s colonial practices.